Much of the area surrounding the town of Bicheno is dominated by impressive granite geology that forms a unique underwater environment. Massive boulders create a myriad of underwater caves and swim-throughs, and provide shelter from the swells that hammer the east coast. Diving in the area caters to both the novice open water and experienced deep technical diver, but the quality of Bicheno diving only improves with the depth. The majority of diving is found on the eastern side of Governor Island which was declared a marine reserve in 1991. Abundant sponge gardens, impressive kelp beds, prolific fish life and caves packed with delicate invertebrates make Bicheno an ideal destination for SCUBA divers, snorkelers and underwater photographers. This challenging deeper dive, found on the eastern edge of the main rock formations, is perhaps Bicheno's most famous site. Two 10 m tall bommies lie on a sandy bottom in 40 m of water. The granite formations get their name from a spectacular covering of yellow zoanthids that give the bommies a golden glow. Both bommies are covered with sea whips, many of which are encrusted with a thick mass of jewelled anemones. Photographers will enjoy the huge variety of invertebrate species such as nudibranchs, basket stars, sea spiders and cuttlefish that surround the rocks. Large schools of butterfly perch can usually be seen, as well as boarfish, banded morwong, trumpeter and cowfish. The Canyon is a valley between two submerged cliffs that starts in 15 m, just to the north-east of Governor Island. The dive starts by dropping over part of the Hairy Wall and running alongside the Rose Garden before turning across to Paradise Reef and returning to the Hairy Wall where a ledge houses a number of large lobsters. Keep your eyes open for the large gnome kitted out in SCUBA gear. The area is renowned for its enormous and colourful sponges interspersed with ascidians, hydroids, sea whips, sea fans and anemones. The spectacular scenery makes The Canyon particularly well-suited to marine naturalists and underwater photographers. Two large boulders lying against each other form the structure known as The Castle. They shelter plenty of small marine life, and also attract boarfish, butterfly perch, banded morwong and large schools of bullseyes. The main feature of The Castle is a 30m long swim-through at a depth of 25m. Light can just be seen at the end of the tunnel as you enter it. It is quiet dark inside and a torch is essential to see the myriad of life and large lobsters it harbours. The cave opens up to a large sloping flat rock covered with anemones and seawhips bearing large basket stars, and is sheltered by a zoanthid-encrusted overhang. 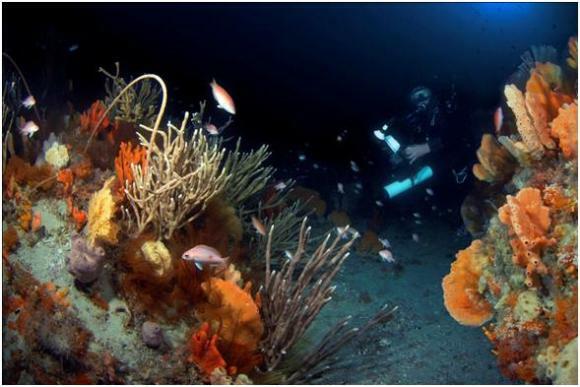 Due to the short bottom time, a few dives are necessary to appreciate the whole area. The Hairy Wall gets its name from an incredible array of sea whips and sponge outcrops that cover a steep rock drop-off running parallel with Governor Island. While many of the area’s other dives start or end on this wall, it’s worth dedicating a dive to exploring the remarkable variety of invertebrate life that collects amongst this sea whip garden. 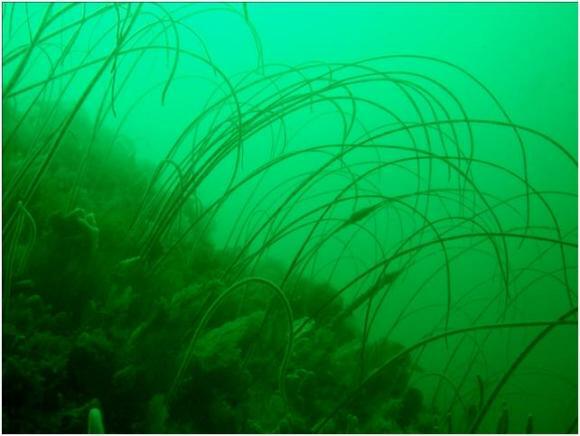 The visibility is often better at this site due to moderate currents that flush the area. Be careful to monitor your depth, as it is all too easy to descend beyond 40m at the base of the wall. This dive features some interesting swim-throughs and caverns in depths of 10-20 m. The rock is visible from the shore (the steep one at the southern end of Governor Island covered in cormorants and seagulls) and is one of the nicest moderate-depth dives around Bicheno. It has three main areas: “The Elbow”, which is found beneath the rock itself, and is packed full of butterfly perch and other fish life; the “t” cave south of The Elbow that supports gardens of sea whips; and “The Ballroom” which lies between the main rock and a large patch of kelp and is a living room-sized cavern encrusted with spectacular jewel anemones. The floor of this cave is carpeted with masses of sponges , and large fish can usually be seen hovering in the shadows. Bird Rock is one of the best dives to see nudibranchs and sea spiders, and is a fantastic shallower alternative to some of Governor Island’s deeper dives. A valley full of sponges lies in 35m of water on a mass of broken boulders between two walls at the northern end of the main diving area. This immense sponge garden stretches for over 100 m as a patchwork of reds, oranges, pinks, purples, yellows and whites. Finger sponges, sea ferns, ascidians, sea whips, sea fans, zoanthids, solitary corals and tube worms carpet the boulderfield which teems with invertebrate life. 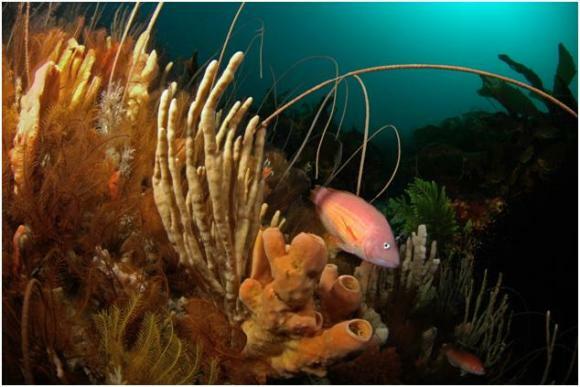 Wrasse, leatherjackets, cowfish, trumpeter, jackass morwong, boarfish and butterfly perch are typical inhabitats of the sponge valley. The diversity of fish and vast array of sessile invertebrates make the dive an excellent spot for scenic divers and photographers, or those easily entertained by pretty colours. Fish rock, also known affectionately as just ‘The Rock’ is without a doubt the most famous shore dive in Tasmania. Entry is via the shelter of the breakwater where you will find yourself on a weedy reef often home to cuttlefish, squid, large schools of mackerel and inquisitive leatherjackets. 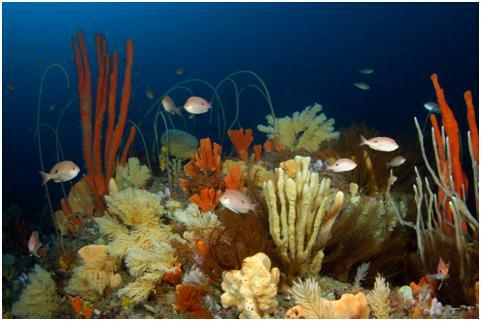 The rock itself is about 75 m offshore in a roughly notherly direction at the extreme edge of the reef. It is virtually impossible to miss if you turn right out of the breakwater and keep the sand on your left. A large split runs through the centre of this 8m tall boulder, and is sanctuary to a large number of fish. Pelagics can often be found circling the rock while seahorses, seadragons and nudibranchs shelter amongst the weed on the rock face. Other invertebrates such as tunicates, sea spiders and hydroids can be found around the rock and on the nearby reef. The dive is an excellent introductory dive with safe entry and exit, and also provides some fantastic night-time scenery. This site is one of the most interesting dives outside the reserve. Located just south of the blowhole and visible from the shore, a collection of large granite boulders lean against each other to form a network of caves, swim-throughs and gutters. The best diving can be found by dropping in on a large upwelling located north-east of the main rock and swimming north-east from here. Numerous swim-throughs open up to small caverns carpeted in yellow zoanthids and jewelled anemones. Be cautious when entering small tunnels in a swell, as there is a lot of water movement through these passages. One of the best medium-depth dives in Bicheno. North of Governor Island in 30-35m of water is a pinnacle that rises to within two metres of the surface. The dive begins at the top of the reef and descends down a kelp-covered gully to a broken boulderfield covered with a multi-coloured mosaic of finger sponges, ascidians, bryozoans, sea whips and yellow zoanthids. 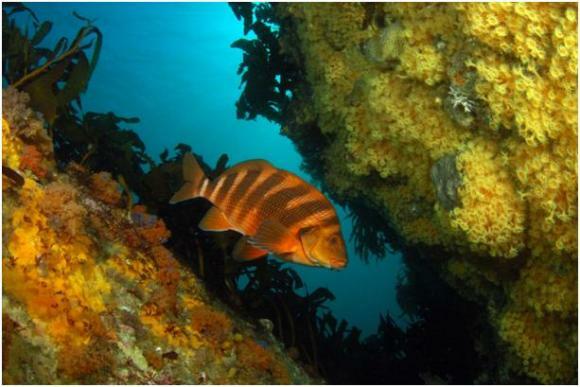 A number of fish species are resident on the reef, including banded morwong, magpie perch, butterfly perch, bearded cod, cowfish and stingarees. A great deeper dive if the swell around Governor Island is too rough.